Du 12 au 13 Juillet 2016 s’est tenu dans la salle de conférence de JM Résidence à Bangui, un atelier sur la Cour Pénale Spéciale en République Centrafricaine co- organisé par Avocats Sans Frontières (ASF) et REDRESS. Cet atelier a connu la participation des acteurs judiciaires, des médias et des organisations de la société civile autour des questions relatives aux éléments clés et les prochaines étapes vers l’opérationnalité de la Cour Pénale Spéciale créée par la loi organique n°15.003 du 3 juin 2015. 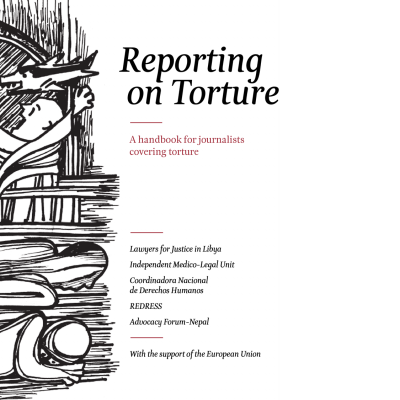 This handbook aims to support and encourage journalists of varied experience to report on torture effectively. In doing so, we seek to assist journalists in the vital role they play in ‘breaking the silence’ around torture - a crime that thrives when perpetrators are left unscrutinised. Available in English, Spanish, Arabic, French and Nepali, this handbook addresses key questions about torture, including what it is, when it happens, why it happens, and what the consequences of torture are. It also provides guidance on how to interview torture survivors in an appropriate way. REDRESS authored the handbook jointly with Advocacy Forum-Nepal (AF), the Coordinadora Nacional de Derechos Humanos in Peru (CNDDHH), the Independent Medico-Legal Unit in Kenya (IMLU), and Lawyers for Justice in Libya (LFJL). It was launched on 26 June 2016, UN International Day in Support of Victims of Torture. The 2010 outbreak of cholera in Haiti - which has since led to the deaths of at least 9,000 people and the sickness of 770,000 others - is understood to have resulted from the improper waste management of a United Nations base. Given REDRESS' extensive experience in reparations law and practice, REDRESS has been invited to contribute to discussions as to how the UN should respond. This briefing paper provides a range of policy options to provide reparations for those affected by the outbreak, all of which reflect applicable international law and standards on reparations. This report, authored by Lawyers For Justice in Libya (LFJL) and REDRESS, builds upon our past legal commentary of Libya’s Draft Constitution 2014 following the publication of an updated Constitutional Draft in April 2016. This commentary reiterates Libya’s international human rights obligations for ensuring the absolute prohibition of torture; provides a comparative analysis of constitutional anti-torture protections from around the world; examines Libya’s constitutional history regarding the prohibition of torture; and makes specific comments and drafting suggestions to ensure that the absolute right to be free from torture and related guarantees are safeguarded within Libya’s future constitutional document. REDRESS has authored a joint submission with the Coalition Ivoiriènne pour la Cour Pénale Internationale (CI-CPI) and Lawyers for Justice in Libya (LFJL) to the International Criminal Court Prosecutor (OTP) on its new draft policy on how to select and prioritise cases. The submission calls on the OTP to ensure transparency in its application of the criteria set out in the draft policy, These comments follow a one-day consultation with civil society groups on the Draft policy, organised by the OTP in coordination with REDRESS, and a separate workshop organised by REDRESS with partners in the Ivory Coast. Our annual report for 2016 provides an overview of the work that REDRESS undertook from 1 April 2015 to 31 March 2016. REDRESS and the Human Rights Monitoring Institute (HRMI) made this submission as part of the Universal Periodic Review (UPR) of Lithuania, which was held in November 2016. This submission focuses on concerns regarding the lack of follow up following the country‘s last UPR in 2011 in relation to Lithuania‘s complicity in, and facilitation of, the USA‘s Central Intelligence Agency‘s Rendition, Detention and Interrogation Program. The submission is based primarily on the experiences of the organisations pursuing truth, justice and accountability on behalf of Mustafa al-Hawsawi, who was allegedly detained in Lithuania during his detention in this program. Namibia is in the process of reviewing its criminal law framework with a view to incorporating the crime of torture in its domestic legislation in accordance with its international obligations. The “Prevention and Combating Torture bill”, which will address this issue, is currently pending in Namibia. In this report, REDRESS provides comments regarding the draft bill to its authors, the Namibian Law Reform and Development Commission. Our comments draw on our recent analysis of anti-torture legislative frameworks in seven African countries, including Namibia, which form the basis of our report “Legal Frameworks to Prevent Torture in Africa”.